International mortuary shipping is a complex industry which presents unique challenges every day. No two countries have the same policies and regulations, and no two shipping situations are the same, so you have to be able to adapt and remain flexible to stay afloat. It can be very hard for funeral directors to handle these arrangements on their own because they don’t always have these types of situations occurring. For over 37 years, NMS has seen many changes in the industry. But as the old saying goes, the more things change, the more they stay the same. So here is a look at some things that change rapidly in the shipping industry, and some that seem to be standing the test of time. The easier it is to find information. There was a time before the internet made all of our lives simpler, and before all of the information that is available in the universe was at our fingertips. Finding forms for international policies used to be nearly impossible, and often those forms had to be sent by regular mail, making international mortuary shipping tough. Now, thanks to the internet, the access is readily available, as are many guideline forms and FAQs to help make international shipping easier. However, this is always changing and NMS shipping specialists usually know about these changes faster than some of these sites update. This is why getting in touch with an expert at NMS is always a good idea. The easier it is to get remains shipped back and forth between certain countries. 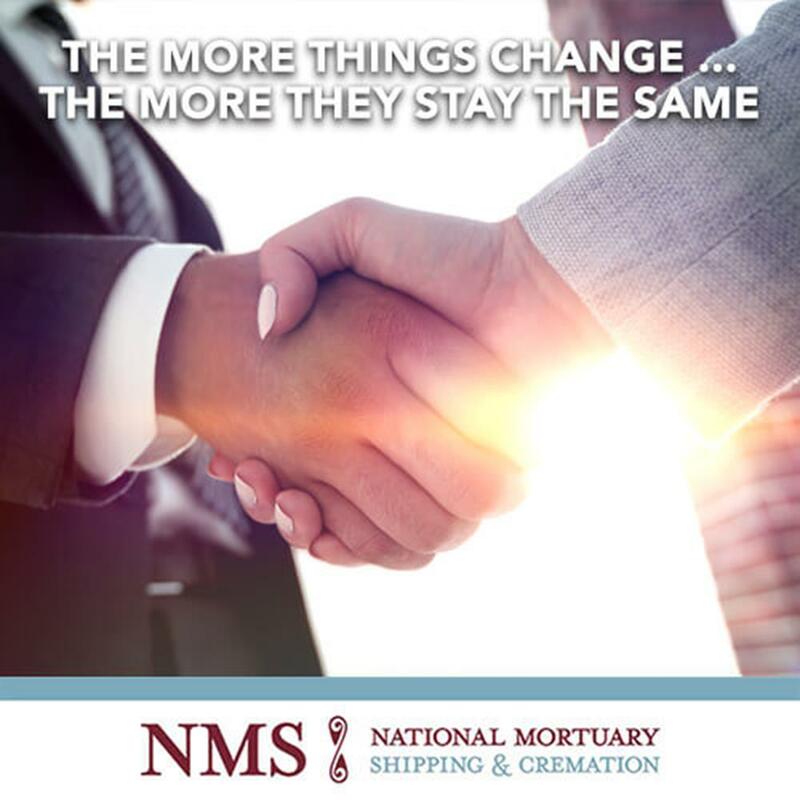 International mortuary shipping has become a large enough business that many countries have their own shipping companies in place to act as representatives to assist in the process. Having “boots on the ground” in other countries helps to simplify the way things move and increases the efficiency of the entire process. Some countries have also loosened some of their restrictions and policies to make things easier. Russia, for example, has changed the paperwork side of mortuary shipping and has simplified the process making it much easier to navigate. You continue to rely on the consulate to get things done. The consulate is the gatekeeper for mortuary shipping. No matter how much easier it is to find the forms you need and get the information you’ll need to make the process more efficient, the consulate for each country is the gatekeeper to get things done. For over 37 years, NMS has been answering that question. You begin with a call to National Mortuary Shipping, and we take it from there. There are few places in the world that we haven’t shipped a body to or recovered a body from. From the simple and routine to the complex, NMS can handle all complicated mortuary arrangements to help you focus on the families you serve. Contact NMS today and let us help you with all of your body shipping needs.